My travel mates and I arrived in Manila around 5 AM and immediately checked into our hotel room in Makati and passed out until noon. Once rested, we sought sustenance. 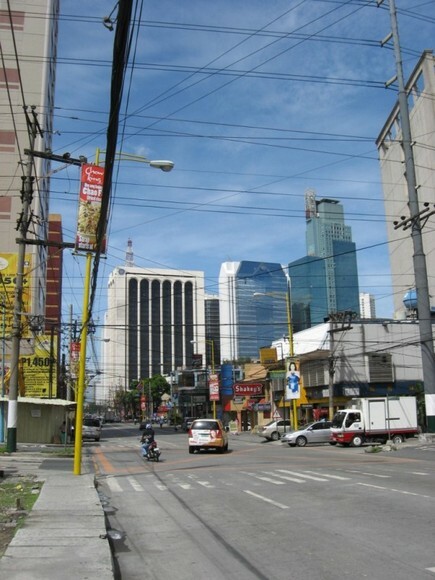 Manila is one of those modern Asian cities with a ridiculous number of malls—we’re talking mega malls with multiple stories and separate wings. 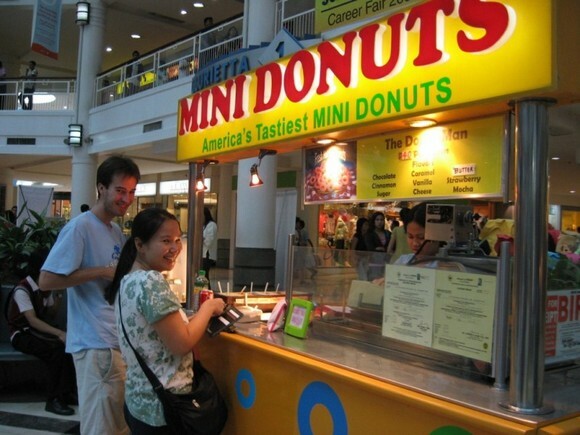 Although it’s rare to find good eats in an American food court (with the exception of Auntie Anne’s), in cities like Bangkok and Manila, it’s the norm. After a failed attempt to locate a restaurant named Kamayan that Chowhounders recommended—the taxi drivers in town weren’t as knowledgeable as we had hoped—we walked to Glorietta Mall and tucked into a joint called Chicken Bacolod. This is where I encountered my very first kalamansi. The specialty at Chicken Bacolod is Chicken Inasal—grilled chicken on a skewer. 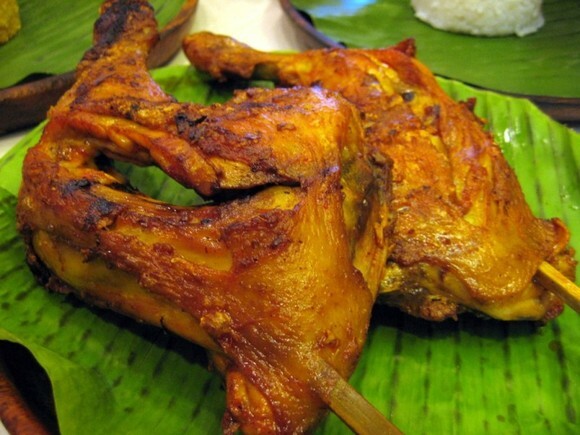 According to Stef over at Noodles and Rice, “Chicken Inasal is an Ilonggo dish, or more specifically a Bacolod dish. The chicken pieces, imbued with a reddish hue from achuete or annatto seeds, is nothing but appealing to your sight, but it’s the smell of inasal cooking that always brings about rumblings in the stomach, and you can’t wait to sink your teeth into it.” She’s totally right. I’m not much of a chicken girl (pork is my favorite), but the chicken here was really great. I really dug the marinade which was a little spicy and Tabasco-esque. These here thighs were priced at 92 PP a piece (44 pesos equals $1 USD). This was also where we encountered molded rice for the first time. 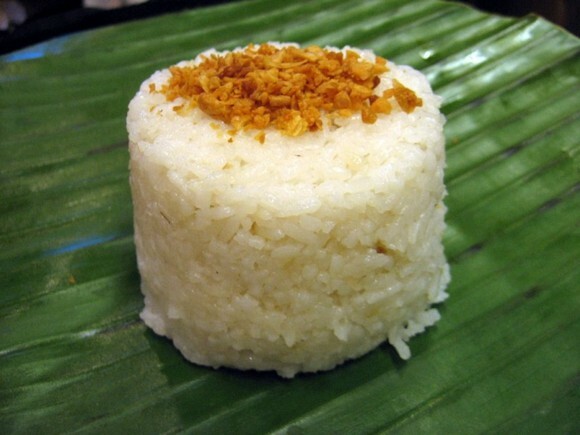 The Filipinos are all about presentation when it comes to rice. We ordered a serving of Java rice, which was made with garlic, ginger, red and green bell peppers, lemongrass, turmeric and butter. 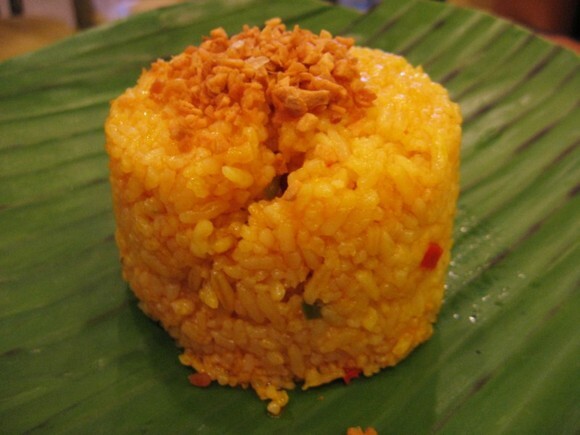 Here’s a recipe from a Pinoy cook for Java rice. We also had an order of garlic rice, which I think is just about the greatest innovation ever! Who wants plain rice when you can have garlic studded fried rice? This version was not especially garlicky, but we enjoyed some real winners throughout our trip. 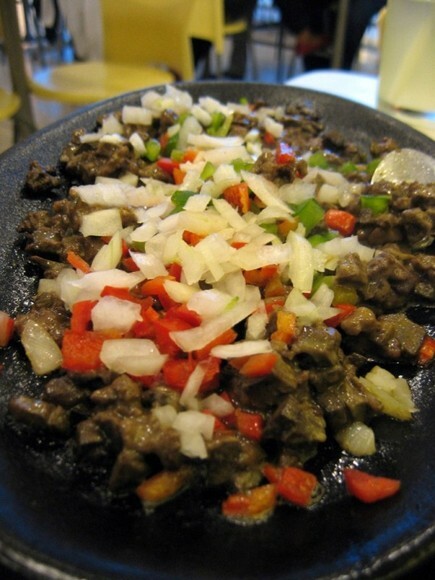 Our waiter recommended that we order Beef Sigsing (165 PP), a classic Pinoy dish that reminded me of fajitas. It included onions, red and green peppers and bits of beef and liver. It arrived sizzling and smelled of meaty goodness. Even though I’m more of a gizzard girl, I didn’t mind the liver at all. 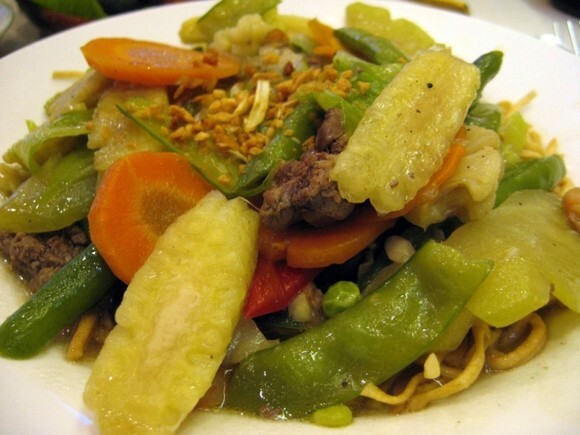 I requested that we order the Pancit Efuven (115 PP), a stir-fried noodle dish. I’ve tasted pancit prior (a homemade version from my mom’s co-worker), but never knew there were so many different varieties. This one was made with slightly thick egg noodles and included a slew of vegetables and more liver. It was good, but not great and could have used more noodles and fewer doodads. 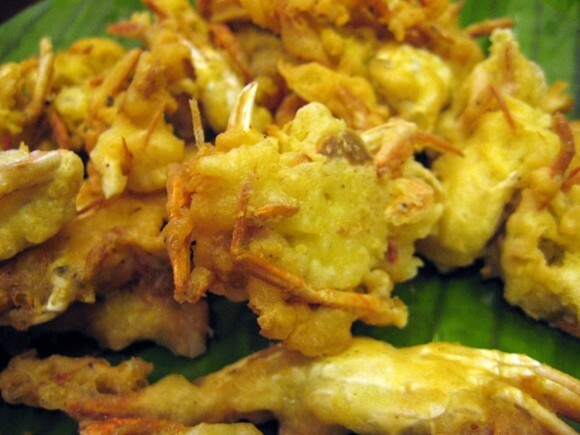 Nina needed something deep-fried with her meal and decided that Crispy Crablets (95 PP) fit the bill. The crabs lacked the oomph of soft shells and the tempura batter was a bit tasteless. We all agreed that the crablets desperately needed a sauce because the kalamasi, soy sauce and vinegar mixture couldn’t hack it. Whereas Nina requires deep-friend goodness, Cathy requires vegetables at every meal. 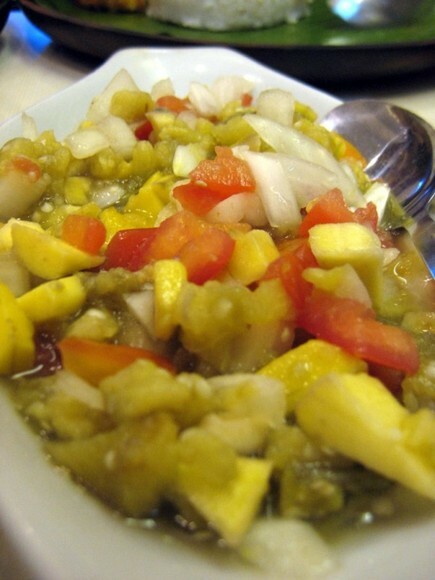 The Ensaladang Talong (65 PP), eggplant salad, was prepared with green mangoes, tomatoes, onions and a really tangy vinegar-based dressing. Although too intense eaten on its own, paired with our other dishes, the eggplant salad really worked. 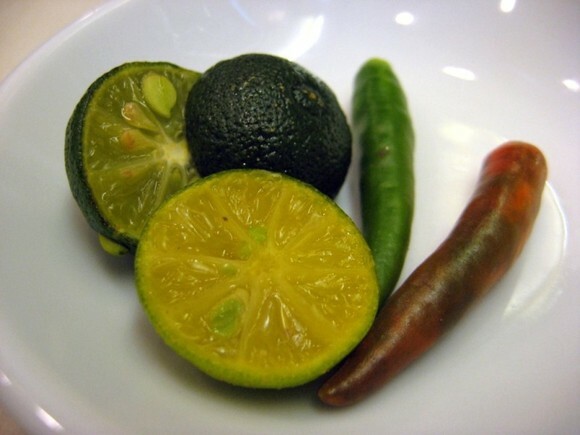 Here’s a recipe for this dish from Pinoy Cook. After our great meal at Chicken Bacolod, Nina and The Astronomer bought some donuts for dessert. By the way, Filipinos seem to really embrace western foods, especially Shakey’s. 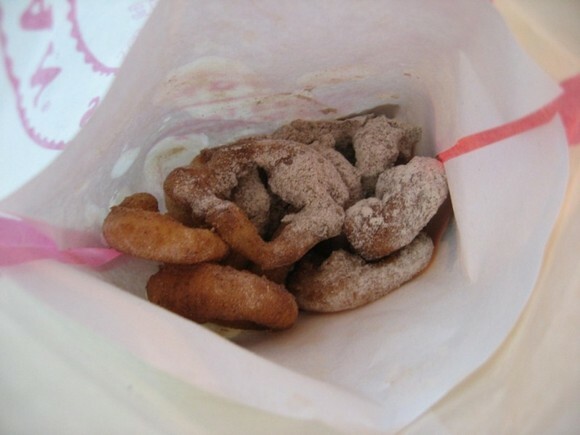 A money-shot of the cinnamon donuts. No me gusta!